When it comes to building a beautiful look, you deserve to use high-quality, long-lasting tools like these. They’ll save you time, stress and money in the long run and keep you looking your best for many makeup trends to come. Mary Kay® Compact Mini is tiny enough to tuck anywhere. Mary Kay® Compact is the essential that every woman needs. 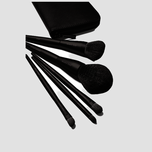 The Mary Kay® Essential Brush Collection includes five high-quality, precisely shaped brushes which are ideal for creating a range of look, packed in a stylish, portable clutch. New brush shapes help anyone create makeup looks with confidence. Each brush performs on blendibility, application and pickup. Synthetic bristles are compatible with liquid, cream or powder. *Mary Kay® Compact Mini - U.S. Pat. D629,201 and Other Pats. Pend.